Only at col legno with bonus track (encore)! Our download album also includes the encore of the live performance. 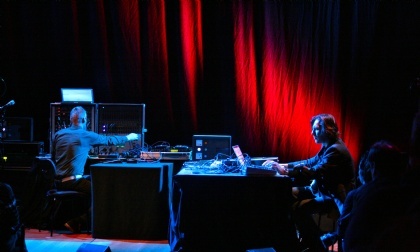 Equipped with a modular synthesizer, a guitar and electronics Patrick Pulsinger and Christian Fennesz approach the master of the treatment of silence, John Cage. The piece on this album, which was recorded live at Wiener Konzerthaus, was inspired by the underlying attitude of Cage’s String Quartet in Four Parts. Upon invitation by the WIEN MODERN festival the two legendary electronic music protagonists tackled the composer’s early string quartet, took it apart and adapted it for two players, always bearing in mind the original instrumentation. Rhythmic structures and the play with silence, motifs and repetitions were treated like quotations having undergone a lengthy transmission process, and were then put together and made into an intriguingly contemporary model. The modular synthesizer, wholly analogue and musically flexible, took its bearings from the viola and violoncello. The two violins were represented by Fennesz’s e-guitar, which is coupled with electronics to generate an intense world of sound. With tiny phrases, microtonal elements and complex sounds Pulsinger / Fennesz create an intense musical experience that permits an interplay between active listening and passive absorption, stimulating the listener’s imagination in wondrous ways. All music composed by Patrick Pulsinger & Christian Fennesz. Recorded live at Wiener Konzerthaus, commissioned by WIEN MODERN festival 2012. Magnificent compositions and an outstanding ensemble: The Arditti Quartet plays Saunders, Mason, Bedford & Zorn! Rhapsodic, lyrical, virtuoso, and, in the end, even amusing: all these attributes come to mind as Cerha’s violin concerto is finished off with a charming punch line. A "Best-Of" the extraordinary late night concerts with Marino Formenti, recorded at WIEN MODERN 2011!